In magnitude, it’s an animal holocaust surpassed only by the hell of factory farming. Indeed, the carnage is so unrelenting that by the time you finish reading this column, more than 6,500 additional animals will have succumbed in the U.S. to lethal encounters with fast-moving vehicles and uncaring or incompetent drivers. Compared to this victimization, human casualties—50,000 a year–pale into insignificance. 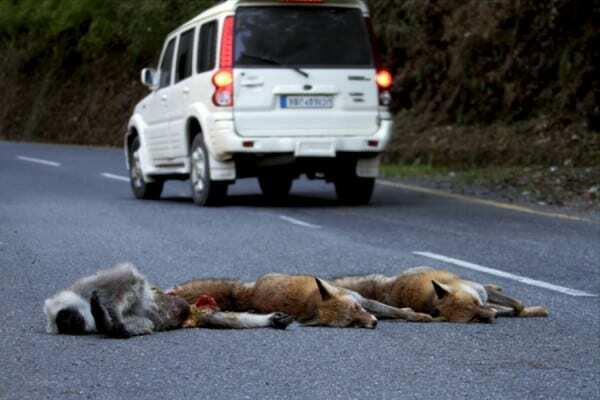 For every human fatality 80,000 animals die on the road. And the slaughter is likely to get worse: Congress has just raised the speed limit on some rural highways, where many animal killings occur, to 65 miIes per hour. 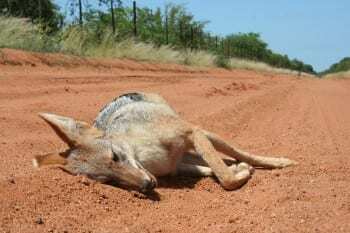 Roadkill figures are very high in the US, but the carnage is global. As the accompanying images illustrate, from North America to Australia, Paraguay, Singapore, India, Africa, Thailand, China and Europe, no country or continent is safe for wildlife in the proximity of roads. Yet the problem is not only a question of speed limits and irrepressible highway and urban proliferation. Its roots go much deeper, to the cultural and economic origins of the Great American Highway, and our unbroken romance with the private automobile. For a nation in love with the idea of privacy the automobile was the logical choice, and it seemed an affordable choice, too, at a time when oil was thought inexhaustible and gas-engine pollution was no more than a gleam in the doomsayer’s eye. The final push toward highway proliferation came in the wake of World War 2, when the massive exodus of the new, affluent middle class to suburbs without adequate public transportation triggered an aggressive program of road construction all over the United States. The ambitious highway construction program received an added boost from the Eisenhower administration as it made preparations for rapid deployment of war materials and military units across the US. In the 1950s, no one could foresee the actual consequences of such actions. 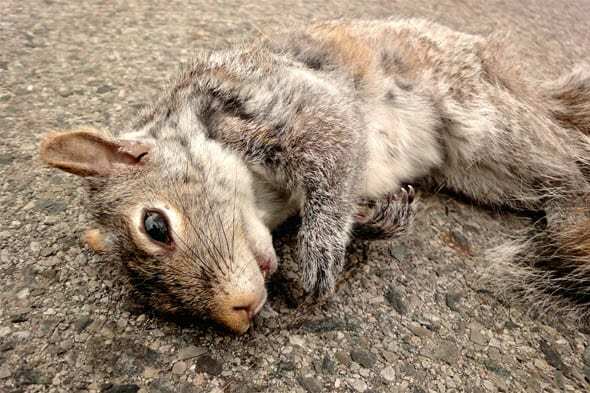 A squirrel surprised by one of the million of vehicles imparting impersonal death. (click to expand). These developments pleased (but scarcely surprised) the auto industry. Hardly a disinterested observer, the industry, led by General Motors, had long pressed the American government to dismantle most forms of public transportation. The switch eventually doomed numerous rail and bus systems across the nation; by the late ’40s the car and its inseparable sidekick, the highway, had won. From that point on, the yearly advance of the asphalt ribbons became a fact of life in the young, car-addicted republic. The problem of the omnipresent highway is as much a political as a technical one. Without relaxing the mesmerizing influence that runaway individualism and the powerful auto lobby exert on national policy, without an energetic campaign of public education, the chances for real gains are remote or nonexistent. A new national mass transit and freight system. Whatever else is done, it’s indisputable that a shift back to urban, suburban and interstate railway and bus systems, especially for commuting and freight purposes, would greatly reduce highway congestion, pollution and fatalities. A variety of organizations are now advocating increased federal and state funding for improved public transportation. Whenever possible, animal advocates should support (or suggest) such initiatives. Urban redesign and better utilization of land resources. In the not-too-distant past most people lived and worked in the same cornmunity. Traveling great distances to the workplace on a daily basis was unthinkable. Modem industry gradually broke up the former integration of working and living spaces, but the 21st Century may yet see a return of the “integrated” lifeplace. Because of economic criteria, a higher ethical awareness, and the possibilities afforded by the wholly “computerized environment,” urban planners are now better positioned to design more efficient housing and more self-contained communities. By reducing human pressure on habitats, housing and industrial design geared to maximizing available space may play a crucial role in helping the environment and the animals. Improvements in highway and automobile design. Ideally, all new highways should incorporate animal welfare and habitat-sharing standards as legitimate design questions. A great deal of truly creative research needs to be done in this field, with ethologists providing data on the habits and characteristics of numerous species. The object, of course, would be to deter and interdict random animal access to the roads, while providing safe crossings at adequate intervals. This might prevent the current “fracturing” of animal habitats, while still allowing the animals to cross roads to gather food, find shelter, rejoin their offspring or simply get home. Scent deterrents, human-inaudible sounds, electric-eye fencing, overpasses and underpasses are some of the possible techniques. The perfect solution is nowhere in sight, but the U.S. must join the search for answers, and there are exciting industries waiting to be born. Naturally, all such innovations would have to be incorporated in both new and existing roads. To complement all the above, the gas-engine vehicle itself might have to be considerably enhanced. At present there’s an acute need for improved nighttime visibility (i.e., non-glare high beams) and for better communications between drivers, especially new signalling devices to warn oncoming traffic when an animal or another emergency is spotted a few hundred feet ahead. In addition, on-board animal deterrence and driver-alert systems based on radar or infrared technologies might provide the crucial edge to avoid fatal collisions. 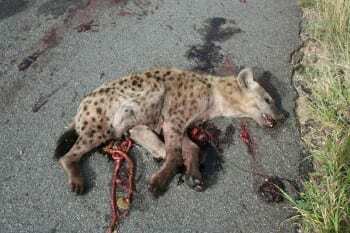 Roadkills needn’t be accepted as the “inevitable” price of progress. New types of highways—judiciously built, including the new “smart highway” concept—coupled with urban and automobile improvements can go a long way to relieve human pressures on the animal world. In adopting these measures, Americans will not only regain some of their lost fellowship; in so doing they’ll also hasten the day when the freedom to drive someplace will not automatically imply the high probability of depriving countless innocent animals of their lives. PATRICE GREANVILLE is one of Animals’ Agenda website’s founding editors. 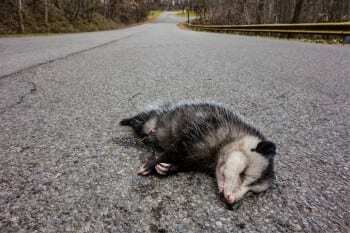 He is National Director of The Voice of Nature Network (VNN), whose National Anti-Roadkill Project (NARP) attempted in the late 1980s to do something about this issue. For further information about this topic, be sure to check the archives of ANIMAL PEOPLE, a site devoted entirely to reportage on animal questions around the world. 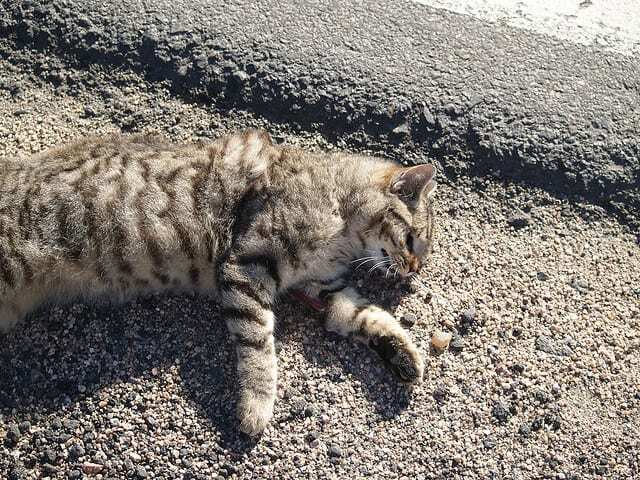 A recent study showed that insects, too, are prone to a very high risk of roadkill incidence. Research showed interesting patterns in insect/butterfly road kills in relation to the vehicle density. Although the insect community is equally at risk, much of the attention goes to bigger, more charismatic animals. About 350,000 to 27 million birds are estimated to be killed on European roads each year. *The actual figure in 2004 is put between 190 and 250 million casualties each year, still a major assault on domestic animals and wildlife. Copyright 1987-2005 The Voice of Nature Network, Inc. A 501(c)(3) organization. This study may not have considered differences in observability among taxa (i.e. 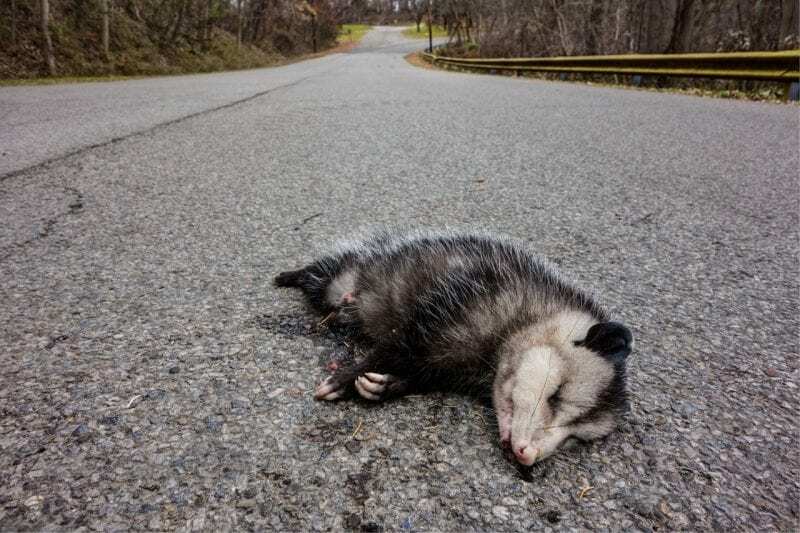 dead raccoons are easier to see than dead frogs), and has not been published in peer-reviewed scientific literature. Great article with some terrific solutions. I don’t own a car and don’t have to. I have the good fortune to live in a city with terrific public transportation, but many people don’t have the option. It’s time for people to start demanding better public transportation options as well as more bicycle lanes and pedestrian sidewalks. Implementing many of the solutions stated in this article would create a better quality of life for people and animals alike. In addition, it would create thousands of good jobs that this country’s citizens desperately need. Years ago I heard of a gadget that you put on your car hood, and it made some sort of noise (activated by the car’s movement, I think) that acted as a warning/deterrent to animals. Any knowledge of that, and possible effectiveness?